Average Weight	: 75 - 100 lbs. Captain Max Von Stephanitz is often referred to as the "Father of the German Shepherd". In April 1899, he registered a dog named Horan as the first Deutsche Schaferhunde, which means German Shepherd Dog, so the word "dog" is actually part of the breed's name. The dogs were presented at Hanover in 1882, and the shorthaired variety was first developed in Berlin in 1889. In 1925 he wrote a book, "The German Shepherd Dog in Word and Picture", which immortalized the breed. Von Stephanitz was a noted disciplinarian and headed the Society for the Promotion of the Breeding of German Shepherd dogs from its founding in 1899 until 1935. He guided and directed an intensive-breeding program to fix type and was adamant in his demands for utility and intelligence. Even today, this breed of dog is known for being one that is very reliable in terms of behaving and performing to type. After WWII, the popularity waned due to their association with Hitler and his reign of terror. It was during these post WWII years that the British changed the dog's name to Alsatian, and then later to Alsatian Wolf Dog, to remove the stigma of having the word German in their name. •	German Shepherd Dogs love strenuous activity, preferably combined with training of some kind. •	Very intelligent and crave a good challenge. •	Need daily, brisk, long walks, jogs and enjoy running alongside you bicycling. •	The German Shepherd will do okay in an apartment if sufficiently exercised. •	Relatively inactive indoors and do best with at least a large yard. •	This breed sheds bits of hair constantly and is a seasonally heavy shedder. problems, bloat, epilepsy, chronic eczema, keratitis (inflammation of the cornea), dwarfism and flea allergies. The German Shepherd Dog has a distinct personality. They are confident and strong in their behavior as well as in their appearance. They are typically fearless, but they are also fiercely loyal and protective. They are extremely eager to please, particularly once you've established yourself as the "alpha dog". A German Shepherd Dog will fight to the death for the life of his owner and is strong enough that he may well win the battle. The German Shepherd Dog's body and strength make it well suited for working and they have been used for years as working dogs. They are often used for police work, as security dogs, as herding dogs, as service dogs for the blind and hearing impaired and as military dogs. This dog's intelligence, sense of smell and work ethic make him suited to nearly any task you'd choose to train him for. German Shepherd Dogs are prone to hip dysplasia. This problem is mostly the result of indiscriminate Breeding programs. Before purchasing a German Shepherd Dog puppy, be certain that both parents have their hips certified OFA good at the very least. Your German shepherd Dog will benefit from a quick brushing about twice a week. If he is not brushed regularly, you'll find lots of short dark hairs in your house, and you may also find that his undercoat, particularly on his stomach and around his neck becomes matted. Find a brush that is good at removing hair, as wells as one that your dog enjoys being brushed with. The German Shepherd Dog is a strong and athletic breed, and they do need exercise. A large yard for running or daily walks with their owner will keep them healthy and strong. Because of their intelligence, they love a challenge and will do quite well at many different activities including agility training, tracking and obedience training. In addition to providing the mental challenge this dog needs, these activities ensure that he gets proper exercise, as well. The German Shepherd Dog is one of the most intelligent breeds of dog and one of the easiest to train. Training should begin at a young age, and should be handled with patience and consistency. Because they are so intelligent, it's important to train them firmly from the very beginning. However, overly harsh correction will only make the dog stubborn and willful, so it's best that you be patient and praise his good efforts. He will likely housetrain very quickly, particularly if you crate train him. This breed is so intelligent and so enjoys a mental challenge that they can be trained to do nearly anything; a fact that is proven by the many jobs they've had over the years. Many people associate German Shepherd Dogs with being aggressive watchdogs, but this behavior is the result of training. A German Shepherd Dog will always be protective of his family and will always be wary of strangers, but they are not aggressive by nature. Because they are wary of strangers, socialization should begin at an early age. It is important for your German Shepherd Dog to be intuitive about your reactions to people who come into your home. Once your dog learns your reactions, he will gauge his own, and your friends will be his friends. However, if he senses that you're concerned, he'll be concerned and as protective as he believes is required. This is one dog that will consistently take cues from his owner. So, over time, the two of you will become fast friends and you'll be able to rely on your German Shepherd Dog's behavior. Playing games and participating in activities is an important part of bonding with your German Shepherd Dog. He will want to be active, and will enjoy participating in activities with you. Because of his great sense of smell, "find" is a perfect game for this breed. But, he'll also love to fetch and play ball and Frisbee. German Shepherd Dogs have a great sense of humor, so you'll both get lots of enjoyment out of simply having fun together. 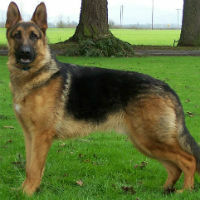 The German Shepherd Dog is a very fast runner and also has great endurance. If you're a runner, this dog will be your best running companion ever.